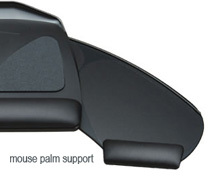 This addresses every ergonomic need of even the most selective user. 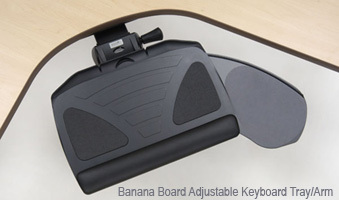 The Banana Board Platform slides to the left or right creating a functional mouse platform for either right-handed or left-handed mousing and data entry. The premium keyboard and mouse combination is customizable to accommodate any user for just about any task. ONE-STEP ADJUSTMENT: unlock, adjust and re-lock. 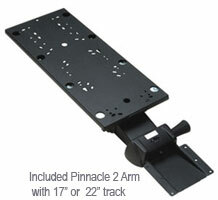 Easy adjustment quickly allows for plenty of knee clearance thanks to the unique slim mounting bracket that will fit almost any workstation. Optional JelRite® gel-fill upgrade is temperature-reactive jel-foam forming to the palm during use. The adaptive contouring greatly relieves pressure points and facilitates long hours of comfortable use.